Over Dard (オーバーダード aka Hiroshi Satou; 佐藤弘) is known for his sculpts of ero-figures with chestal regions of improbable proportions. His professional work has primarily been on large scale PVC and polystone figures, but recently due to what seems to be an interest in Girls und Panzer, he has started producing garage kits in 1/35 and 1/72 scale to sell at the Tokyo Wonder Festival. The S.M.G. Runa Heavy Weapons Set (S.M.G. 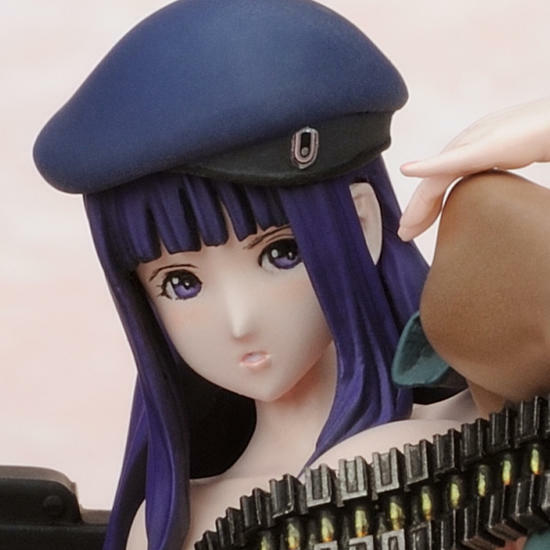 瑠奈 重火器セット) was first produced for the 2015 Summer WonFes. It comes with the eponymous Runa, M60, Browning M1919A4 .30 caliber, MG42, MP40, jerry cans, and some ammo boxes, drums, and belts. The figure and accessories are cast in a nice firm resin, and the pieces were easily removable from the sprue. There was some flash on the weapons, but it came off with some light scraping using the edge of a knife. I had the most issues with the ammo belts, both of which broke during the clean-up process. It was simple enough to reattach the broken ends with CA glue though. The grip of the M60 was incomplete, and the barrel of the Browning was a bit warped, but I've had a lot worse from other resin kits with parts as small as these. It would have been a nice nod to the original S.M.G. 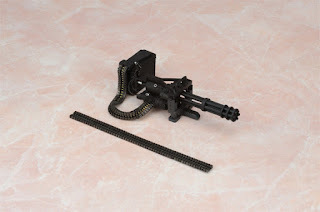 series figure if the 1/72 set came with a M-134 Gatling Gun though. The original character Runa (瑠奈) comes from the S.M.G. series of 1/12 scale ero-figures produced by Daiki Kougyou (ダイキ工業). Small scale Runa in her micro-bikini is much, much tamer than the larger figure. Now normally, I would not bother with buying miniatures with disproportional body parts of any type, but I just had to get this figure for the uh... novelty factor... yeah... In any event, most of Runa scales out nicely in 1/72 scale, and I hope more garage kit makers will venture into the 1/72 market. Vulture-headed lions, fifteen feet high, prowled in hungry anticipation towards them, their feathered manes rustling as they approached. The creatures of Matik were called vulture-lions in the AD&D Deities and Demigods entry under Melnibonéan Mythos. They were created from "the stuff of unformed madness" by the sorcerer Matik. Jeff Dee's illustration of the vulture-lion shows what is essentially a lion with a vulture's beak. Moorcock's description in the novel, suggests that the creatures had feathered manes and tails. To represent these creatures, I always thought that the Scauweg from SLAP Miniatures were spot-on. I finally decided to place an order for them, and after a long wait, I've finally received the miniatures. Unlike the miniature shown on the SLAP website, the Scauweg 1 model that I received looks like it is in a crouching/pouncing pose. I believe it was probably crushed during shipment, but the end result doesn't look bad. The Scauweg scale out to about 9.5' to 10' at the shoulder in 1/72 scale, rather than the 15' described in the novels, but I think that these hefty models still make for impressively sized monsters. On the SLAP website, the Scauweg are painted with red colored heads like turkey vultures, and I'm a bit curious if that is what comes to mind when people in the UK think of vultures. In any event, I'm going to paint them like Cape vultures or white-backed vultures from Africa as opposed to a North American bird.